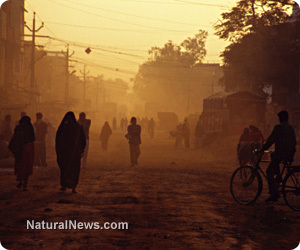 (NaturalNews) A suo moto probe has been issued in India, as dangerous levels of pesticides continue to show up in produce served in India's open markets. Suo moto probes are often issued by courts when the subject matter is dire and of public interest. Upon the revelation of new findings in early March 2014, the High Court of Delhi declared that much of the produce sold in the open markets is unfit for human consumption. After a court-sanctioned committee tested various fruits and vegetables from Delhi's open markets, results showed high levels of various toxic pesticide residues. According to the World Health Organization, some of the residue contains pesticides banned in other parts of the world. Delhi, the capital city of India, boasts a population exceeding 16 million people. These millions of unaware people have literally been consuming produce that is tainted with invisible poisons. After obtaining high pesticide readings, "beyond the maximum residue limit," the Delhi High Court instructed the government of New Delhi to set up a "Pesticide Residue Management Cell" within the next month. The city government, along with the Ministry of Agriculture, is now instructed to alert consumers and farmers of the banned pesticides lurking in their produce. This includes a mass public awareness and translation campaign. State and national government workers are to be deployed by court order to translate information about pesticides to the various local languages. The goal is to inform consumers and farmers alike so that the majority will demand changes in how their fruits and vegetables are grown. The Court declared that the Food Safety and Standards Authority of India has failed in their duty to protect consumers from harmful pesticides and that consumer awareness is key to making much needed changes in the coming years. Delhi's vegetable stands, railway stations, bus stops, and even some websites are to include warnings about the dangerous levels of pesticides in open market produce. The court order also requires periodical pesticide tests for fruits and vegetables sold throughout the city. The current tradition of inspection requires a panel of experts to go out and test open market produce once a year. They submit their annual report to the Ministry of Agriculture detailing levels of pesticides in the open market produce. The reports are never made public. The new court order demands inspections at least once a month and for these reports to be made public. Back in 2010, experts assessed levels of 106 different types of pesticides throughout India, from Delhi to Bangalore, from Kolkata to Mumbai. Harmful levels of pesticides weren't just found in New Delhi, but were found throughout India's cities. For example, mangoes routinely held DDT residue, the neurologically damaging pesticide banned in the 1970s by Western countries. India and China, on the other hand, still spray the toxic DDT chemical domestically en masse. An entire list of controversial pesticides was confirmed all over produce at levels unfit for human consumption. These toxins have been studied at universities around the world for causing kidney complications, lung ailments and even cancer, experts reported. For instance, cherries in India's capital contained residue of endosulfan, which is a highly poisonous insecticide linked to mental and physical disabilities. The dark reality of this insecticide was reported on in India's southern state of Karnataka in February 2014. 1,815 victims fell sick after endosulfan was sprayed all over the food that they consumed from a specific plantation on which they relied for food. The Hindu reported that all victims were compensated for the pesticide poisoning, which caused severe illness. As the hammer hits the bench in the High Court of Delhi, the dangers of pesticides will be brought before the public. The Ministry of Agriculture and the government of New Delhi are now tasked with presenting long-term measures to address high pesticide levels in India's agriculture. The next hearing in the case is scheduled for April 15 as new pesticide residue tests come before the court.